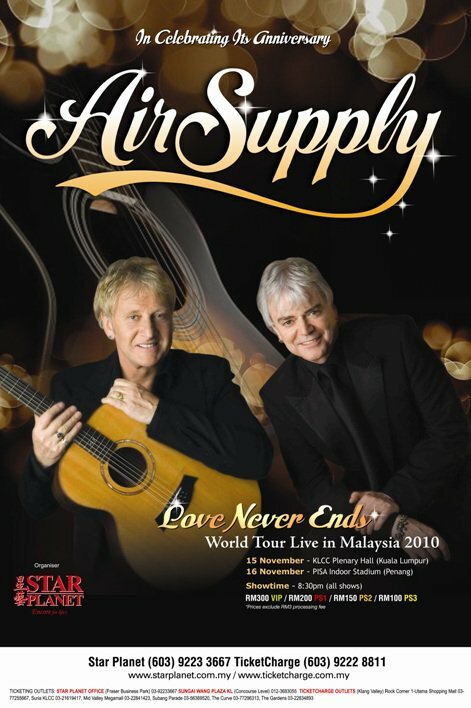 Air Supply is coming to Penang!!! Yes. On 830pm, 16th November 2010, the Australian soft rock duo will be charming all their fans with their greatest hits like ‘Making Love Out of Nothing at All’ and ‘All Out of Love’ at PISA Indoor Stadium. The price of the tickets are: VIP seats RM300. PS1 category RM200. PS2 category RM150. PS3 category RM100. You can buy the tickets from Speedy Queensbay Mall (04-6412653), Lo Hong Ka Gurney Plaza (04-2274450), SIN-PEN Travel – Bukit Mertajam (04-5306262) & SIN-PEN Travel – Macalister Road (04-2266161). This concert is organised by Star Planet and brought to you to Penang by Hydro Star Gateway. To commemorate their 35th Annivesary, Graham Russel & Russel Hitchcock of the popular Air Supply group is back in Malaysia to serenade our Malaysians. Venue: PISA Indoor Statdium, Penang, Malaysia. Ticket Price: VIP Seats RM300, PS1 Category RM200, PS2 Category RM150 & PS1 Category RM100. More information : Star Planet (organiser) 03-9223 3667. P/S: They do have concerts in other states. 15 November 2010 – KLCC Plenary Hall (KL) & 18 November 2010 – SUKPA (Kuantan).